Victor was alone during the hottest days and coldest nights. The property owners had moved. No straw to protect him from the frozen ground. Water and food were rarely seen by neighbors who helped Victor as often as possible. A resident near there who was a friend of the owners would call the police when he saw them feeding Victor and the police would tell them they were trespassing. The property owners would not let Victor use the doghouse shown in the background. When we provided straw and put it on the ground the owner picked it all up and threw it away. Victor was forced to wear a wide thick collar with heavy hardware attached to a chain. We do not treat our worst human prisoners in this manner, why is any dog forced to live his or her life chained by the neck? On an extremely hot day Victor's mother, Bear who was also chained, was found by neighbors with her chain wrapped around a wood pile. She couldn't get to shade or water. Neighbors tried to help her but she died a short time later. We rescued Victor. 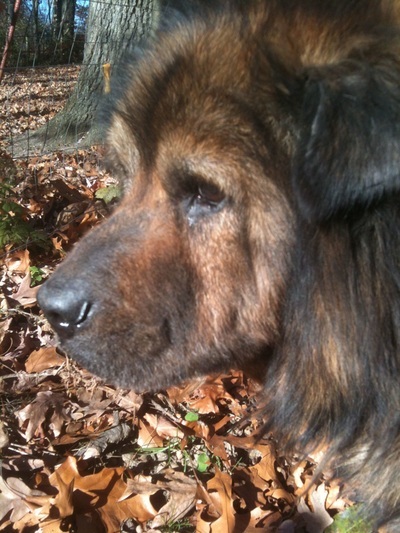 He had been chained for 9 years to a tractor, without a dog house, in Marengo Indiana. The town of Marengo is located in Crawford County Indiana which does not have an animal shelter or any animal control services. 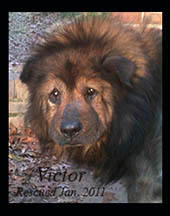 Victor lived year round lying in holes he had dug in the ground underneath the tractor. He would lay shivering on the cold ground, covered in snow and ice. Local citizens began an effort to free Victor from his life of misery. We tried negotiating with the owners, who did not even live on the property, by offering adoption fees to no avail. The owners were not providing daily care for Victor. Neighbors would give him food and water however if the friend of the owners who lived nearby saw them he would call the police and those helping Victor would be accused of trespassing. 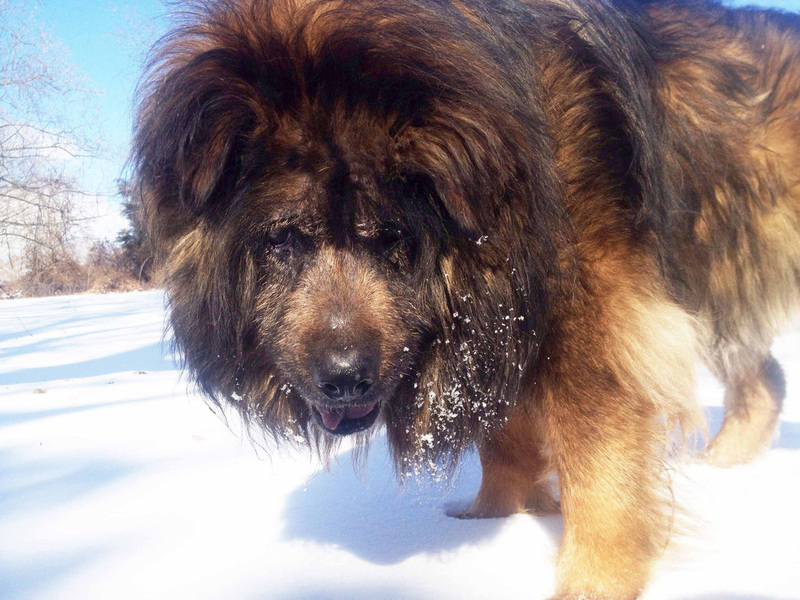 Finally, after months of dealing with snow and serious ice storms and getting nowhere a law enforcement officer made it possible for us to rescue Victor. 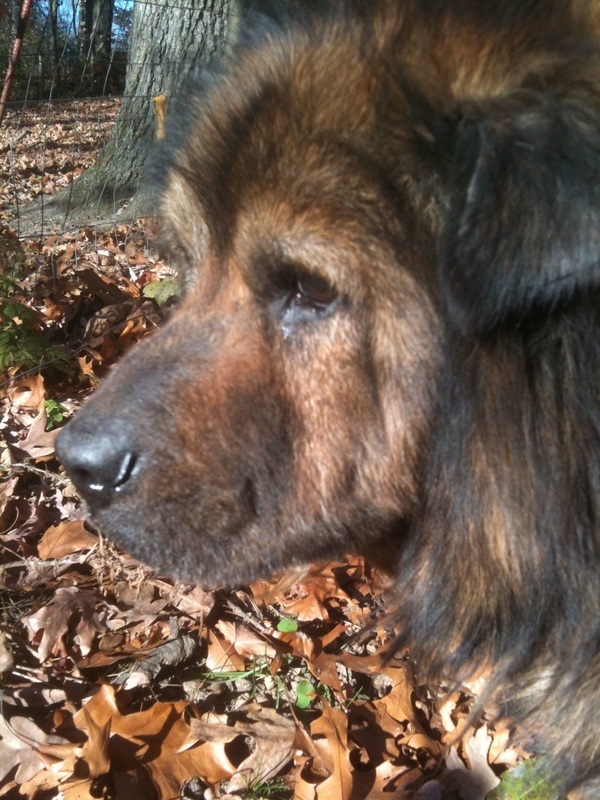 We cut Victor's chain with bolt cutters on January 12, 2011, loaded him in the car and drove him to a better life. 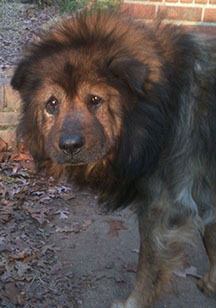 The first vet we took him to worked closely with a rescue group and we expected great concern and care. After keeping Victor there for five days and while we waited for the vet to begin heart worm treatment she said was needed, two people, the vet and the rescue group's director, who were friends, decided Victor did not deserved medical care and monetary donations from animal protection groups who offered. Their reason? Because he was "older", "he wasn't a beloved pet" and he didn't immediately have a home. The very people who were supposed to care turned their backs on him and abandoned him. The vet literally refused to treat him even with advanced payment, refused to provide a medical report for the law enforcement office who helped Victor, then handed us a bill for boarding fees, office exams, and medication. Meanwhile the rescue group director along with the veterinarian's support was working to get another group to pull their $250 donation toward Victor's care. We filed a complaint with Kentucky Board of Veterinary Examiners naming the veterinarian. She is on file with the state regarding this case. We rescued Victor again from the vet and the rescue group and moved him to another vet clinic where he immediately received the care he needed and deserved. For the first time in his life Victor was protected from the freezing weather, receiving food and water every day and enjoying life. Three years after his rescue his age shows more and more - he's hard of hearing and has limited vision but overall is healthy. He's fond of laying on the patio in the sun and then cuddling up in his soft warm blankets for a good night's sleep. He's made plenty of new friends including Kelly Bell who was rescued from choking being chained with a collar which was much too small, more dogs, cats and two horses. Victor is living his golden years in comfort. Victor has also been a working dog using his fame to serve as RVHS' 'SpokesDog' requesting kindness toward all animals. We expect to hear Victor's voice long and loud asking that we help others who live in misery now as he once did. And, yes, Victor is a beloved dog. ​still with us, healthy and happy. We miss you and love you Victor. It isn't just animals who suffer. We will be exploring the emotional impact on those such as neighbors who witness the neglect of chained and penned dogs and see this neglect day after day, week after week, year after year. This issue directly affects more citizens in communities throughout the United States than any other single animal related problem. Plus we will explain how banning the chaining and penning of dogs would eliminate a large percentage of animal suffering.